Magadan, Cultural Centre DK Avtotek, 6 Shandora Shimicha St.
Meeting theme: “The challenges of the mineral exploration and mining project development in permafrost conditions in Russia”. Venue: Magadan, Cultural Centre DK Avtotek, 6 Shandora Shimicha St.
Target audience: Shareholders, Investors, Directors (CEOs, CFOs, CIOs), Directors in charge of technical, commercial and operations planning, Chief geologists, Ecologists, Health and Safety specialists, Engineering and service companies, Mining equipment producers. Speakers: CEOs and leading specialists of Russian and International exploration and mining companies, specialists of the engineering, investment, leasing companies. Discussion themes: The bulk of existing precious metals and diamond output along with the production of some other essential solid minerals (SM) are concentrated in the North-Eastern Russia. The region’s harsh climatic conditions are one of the major obstacles to sustainable development of existing mining operations, not to mention the establishment of new ones. Due to the limited availability of mining projects in other parts of Russia, interest to the projects located in the north-eastern part of the country is rising. The seminar will offer a unique opportunity for Russian and International companies to share their experience and the most efficient ways of overcoming these difficulties and will help participants make strategic and operational decisions to succeed in their business development in this region. • The analysis of the new mining projects development in the North East of Russia. • The typical mining projects in the North East of Russia and challenges. • Technological and technical risks of the projects and ways of their minimisation. • Infrastructure challenges and solutions. • Environmental and social aspects of the mining and mineral exploration in the North East of Russia. • Challenges of financing projects. • Standard delegate fee: USD 160. Excursion programme should be paid separately. Please enquire. 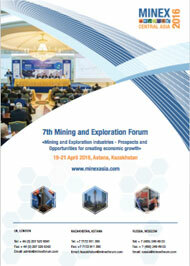 • Complimentary admissions are available to the participants of MINEX Russia Mining and Exploration Forum 2012 in Moscow and MINEX Far East 2012 conference and guests invited by the co-organiser or the seminar sponsors. • Discounts: 10% discount offered when registering three or more delegates attending the seminar. For sponsorship terms and conditions please contact Ms Natalyia Tarasova.